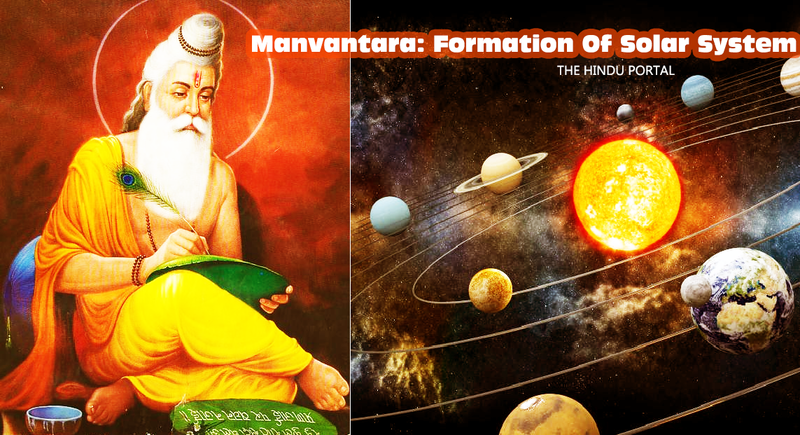 Manvantara is a Sanskrit word in which ‘Manu’ means ‘Progenitor of mankind’ and ‘Antara’ means ‘distance’. 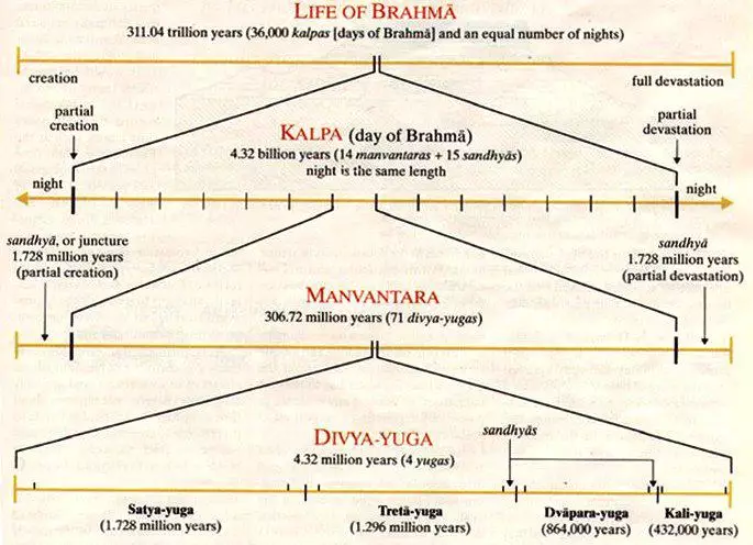 Literally, Manvantara means the total duration of mankind or life span of man. So, it means that each Manvantara is ruled by Manu created by Brahma. It is said that Manu creates the world and other species in the given ‘Antara’ or duration. ‘Kalpa’ is referred to a day of Brahma, takes 14 Manvantaras to create one Kalpa according to the Vedic science. And after every Kalpa, there is dissolution or ‘pralaya’ wherein all the life comes to the state of rest. This period is known as ‘Night of Brahma’. One day and night of Brahma is said to be equal to 4320 million years each. Theories which support gradual evolution. Theories with a hypothetical meeting of the sun with a distant star. 14 Manvantaras together form a day of Brahma. At present we are in the seventh Manvantara, so there are seven more to come. Each Manvantara represents the different stages of formation of the Solar system. The first phase of the formation of the solar system was preceded by a long night of 4320 million years. There was nothing but complete darkness. This long night ended after the rise of a huge nebula and the nebula had a bright twilight which was circular or disc-shaped. All the self-generating activities began along with this revolving nebula. Hence, the first manvatara was named as Svayambhuva which means self-generating. In this stage, the formation of Sun took place and the nebula got completely heated up and was burning. This nebula became a hot mass which was immensely shiny and eventually it developed to become our present sun. Hence the name Svarocisa literally means ‘pertaining to be shining’. The Sun became a full-fledged star in this Manvantara. It reached the optimum size and had enough energy and heat to maintain its family of planets. Sun was now the chief of the main authority. Hence this Manvantara was named Uttama which means ‘highest position’. Tamasa means darkness. This Manvantara has been described as the era of darkness, hence the name, Tamasa. This is the stage when the formation of the earth took place. The earth which was a burning mass became cool and solidified. The day and night formation took place and eclipse phenomenon also began at this stage. In this stage, Earth was completely covered by a thick mass of dark clouds and turned it into a dark planet. Earth faced continuous heavy rainfall for millions of years due to the thick mass of dark clouds. It further led to the formation of rivers, oceans, mountains, and landforms. At this stage, traces of emerging life was noted everywhere on the earth. Incessant rainfall at regular intervals led to the formation of life in and around the oceans, mountains and other landforms. Caksus in Sanskrit means ‘pertaining to eye’ and this Manvantara was named caksusu since all the emerging life had eyes. The seventh mavantara is the present phase in the evolution of the solar system. This manvatara refers to the emergence of man. The word ‘Vaivasvata’ means Sun. According to Indian history, the solar dynasty or the Surya Vamsha was the first and one of the ancient dynasties known. Puranas tell that man emerged 120 million years ago. The future manvantaras peep into a prediction of the end of life and dissolution of earth and the Sun. It is said that dissolution of the sun takes place after 2347 million years after which all the landforms, oceans, mountains will go dry and the earth would completely get burnt and shattered. Six Manus have already elapsed and the seventh Manu is the current one. Twenty-seven Maha-Yugas of the Seventh Manu have passed. Satya-Yuga, Treta-Yuga, and Dvapara-Yuga have also finished. The last Kali-Yuga started at the end of Dvapara-Yuga as the Kurukshetra Yudha ended. The Manvantara theory of the formation of the solar system, as explained in ancient Hindu Puranas, has got complete support of Aryabhata and his postulations.